A few days ago, I was contacted by Chef Jeff. He wanted to get the word out about his new e-cookbook called DinneRevolution. He must have read my mind because this is something that busy moms like me need and something I know my foodie readers would like to have also. I’m a work-at-home home, which means I work while managing the home and looking after my two boys, my husband and son. Yes, we eat out once a week, but most of the time, we have home-cooked meals prepared by yours truly. However, I often find myself running out of ideas on what dishes to cook for my family, and there are times I end up cooking what I have cooked the previous week, much to my husband and son’s dismay. LOL! Now, Chef Jeff’s DinneRevolution is exactly what I need. 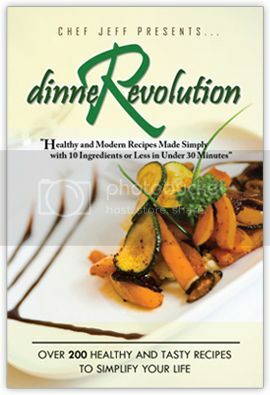 It has more than 200 healthy and delicious dinner recipes, including vegetarian and simple side dishes. Aside from being super family-friendly, these recipes have less than 10 ingredients and take less than 30 minutes to prepare. This cookbook sells for $27, but here’s great news for Delight My Appetite readers! You can have your free copy of DinneRevolution, too. All you need to do is visit this website, enter your name and email and you get instant access to this amazing new cookbook. This entry was posted in Cookbook, DinneRevolution. Bookmark the permalink.